Mummy cookies on a stick for a fun Halloween treat idea. 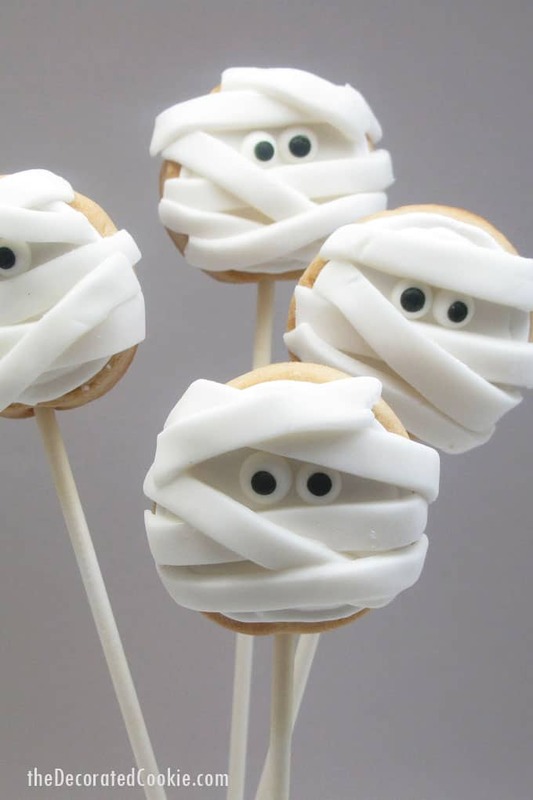 Need more mummy ideas? 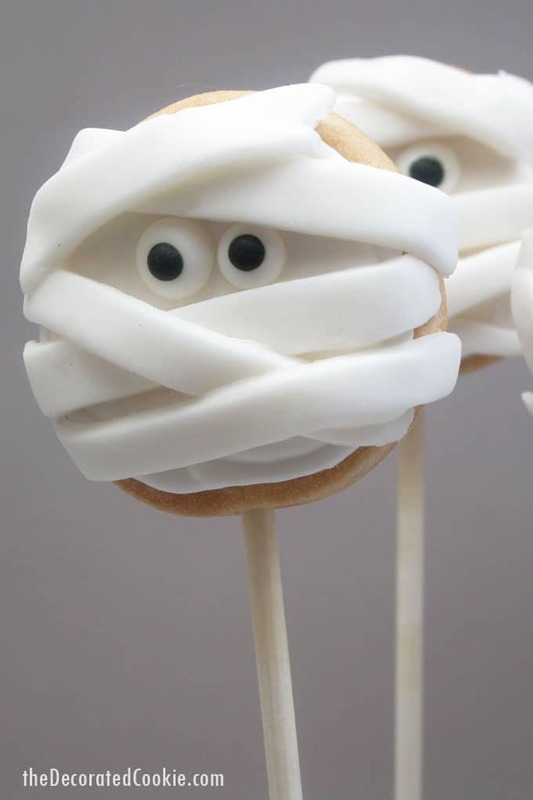 Check out these mummy pretzels or this fruit dressed up as mummies. 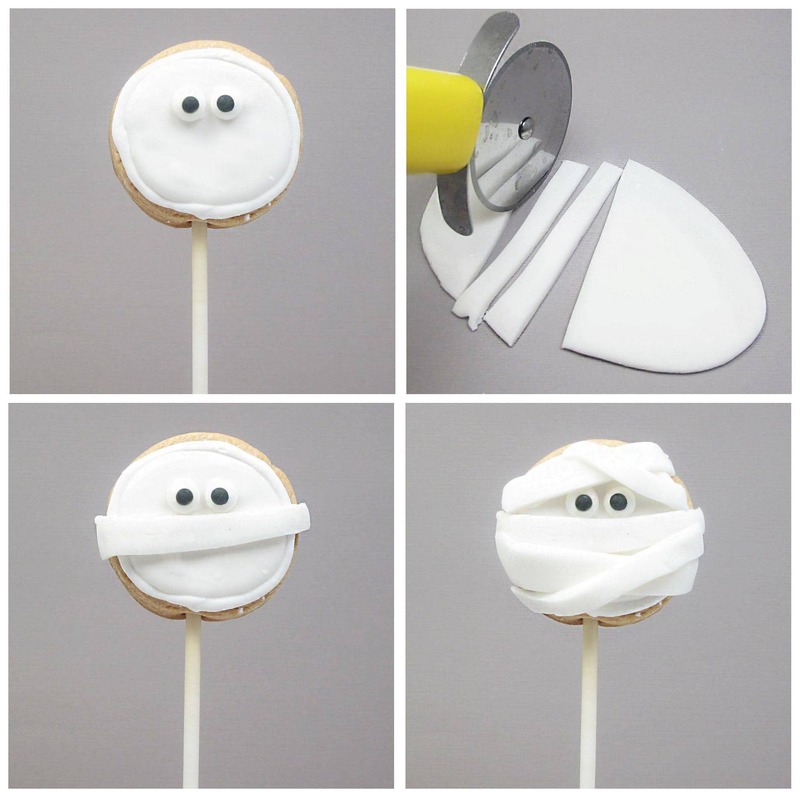 For tips on finding cookie decorating supplies, click here. Prepare cookie dough according to the recipe, chill, roll about 3/8-inch thick and cut out your circles. Insert a cookie stick half way into the circle. The stick should fit fully in the cookie without poking through the back or top. Arrange the cookies on a baking tray and bake according to the recipe. Let cool completely. Prepare royal icing according to the recipe and tint white. Prepare a decorating bag with coupler and size “4” tip, fill with the white icing and close tightly with a rubber band. 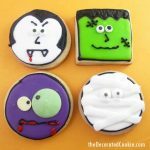 Decorate your cookie background by piping a circle of white icing on the cookie. Then, pipe back and forth to fill the circle with icing. 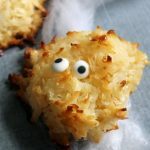 Attach the eyeballs and let the cookie dry for several hours at least, or overnight. 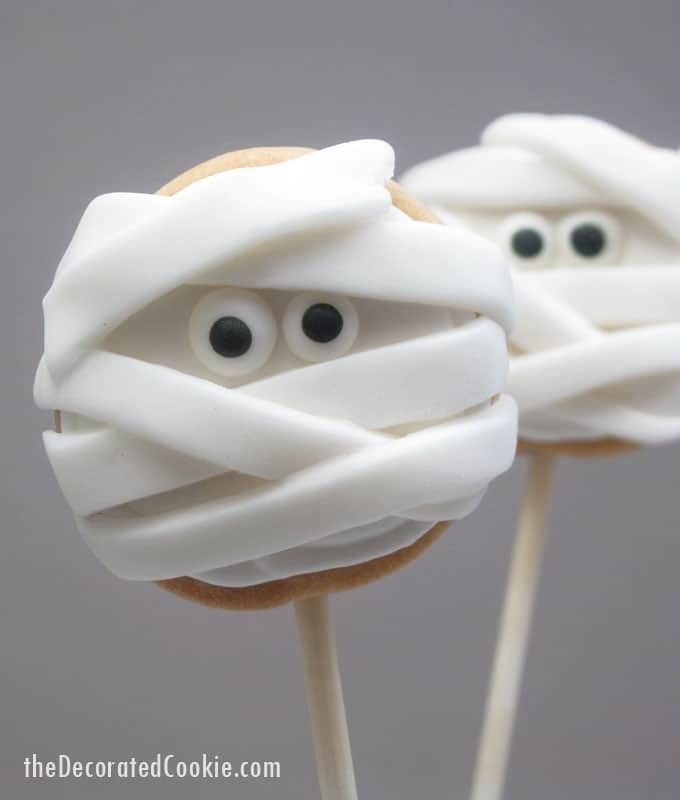 In order to mummify the fondant, briefly knead a handful of white fondant and roll out on a surface dusted with confectioner’s sugar to prevent sticking. Roll fondant about 1/8-inch to ¼-inch thick. 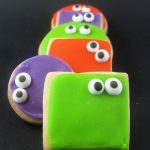 Use the pizza cutter to cut out strips of fondant about 2 ¼-inch long by ¼-inch wide (if your cookie cutter is larger or smaller than 2-inches across, you may need to adjust the length of the strips). Don’t worry if the strips are of slightly different sizes; that will make your mummy look even more real. You may need varying lengths, or snip the ends if they are too long. Use a toothpick or your finger to dab light corn syrup on the back of a strip of fondant, and lay the strips across the cookie at various angles, pressing the ends against the side of the cookie. Let the cookies dry several hours. Cute! I love candy eyes… they come in so handy for Halloween. You are so creative! Love how you turn even the simplest baked goody into a visual treat as well! These look awesome! So excited for Halloween. 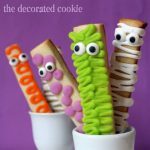 So cute project for Halloween! i love it.